In the last couple of years, after research revealed that sitting too much could shorten your life (even if you exercise regularly), there have been a number of companies who have rushed to manufacture affordable sit-to-stand desks and various desk converters. I was happy to have the opportunity to review a great one from FlexiSpot, and was pretty impressed by what I saw with the M2B 35" standing desk converter. Editor's Note: FlexiSpot sent me a free product to complete this review. This is my honest assessment of that product. The best places to buy this standing desk converter are on Amazon or directly on the Manufacturer's website. After receiving the Flexispot M2B in the mail I unpacked it, set it up at my desk and used it daily for 2 weeks. ​I work from home and spend about 50 hours a week at my desk. By using this product for about 100 hours I gained a good sense of the product's quality and durability. I put the M2B from FlexiSpot through its paces, and became familiar with its best characteristics (and shortcomings). ​This has allowed me to provide an honest and detailed review of this desktop sit-to-stand computer riser, which I like a lot. A simple, affordable standing desk converter that holds up well to daily use. How We Rate It: 5 / 5 stars | Why We Love It: An excellent value relative to other standing desk converters on the market. It held up extremely well to daily use during our 2-week review period. The desk riser arrived well-packaged in a heavy-duty cardboard box. Inside the box, the entire desktop riser was encased in heavy-duty styrofoam and was not damaged at all in transit. ​Instructions in the manual were clear and easy to understand, and there were several 3M cable ties to help you make your monitor, keyboard and mouse cables look neat and tidy. They even include a high-quality mesh cable sleeve you can use on the back of the workstation converter to keep your wires wrapped together and looking professional, a nice touch. After removing the M2B computer riser from the box setup was as simple as setting it on my desk, sliding the (optional) keyboard tray in, and clipping the tension locks into place. It took me 2 minutes to have it on my desk and in position. I was impressed. Frankly, I was surprised by how sturdy this computer riser felt. One of the main complaints with standing desks in general and standing desk converters in particular is that they wobble when fully elevated and in some cases there are tipping concerns. The M2B was a lot more solid than I expected, and it was certainly more solid than other converters I have tried in the past. In my home office I have a 7 foot long red oak desk with breadboard ends that I built in my workshop a few years ago, and I was pleased to see that the Flexispot comes with nice padded feet to prevent any damage. I probably would have boxed it up and not placed it on my desk if this hadn't been the case, so I feel it's worth pointing out to folks with nicer desks who are considering adding a standing desk converter that won't damage their desk. Operating the converter is very easy. It can be raised easily with one hand via a lever just below the desktop on the right-hand side. Lowering the desk converter takes a bit more downward force (this is ultimately aided by the weight of your monitors), but is not difficult. This speaks to the quality of the hydraulic struts. It's easy to lock the desk in to a number of different heights (there are 12 individual height adjustments, one more than is available with the VARIDESK converter). ​I'm 6'2" and on my desk top the keyboard tray was at the perfect ergonomic position when standing (My forearms were at a slightly open position, at about 100 degrees). As I mentioned earlier, I work from home and spend around 50 hours a week at my desk. I have a comfortable ergonomic chair, and take frequent breaks to get up and move around my home, walk my dog, etc. I have two 21" monitors on my desk. I was able to place both monitors on the M2B 35" converter without using a hydraulic mounting arm or anything beyond the stands that my monitors came with. The center of each monitor base was about 6" in from the outside edge on either side, and the two monitors were angled in slightly. The outside edge of each monitor did overhang the Flexispot M2B converter, but my desk backs up to a wall, so that was no issue for me. Switching from sitting to standing at this desk was easy with the weight of my monitors, keyboard, mouse and (large) cup of coffee. I could raise or lower the desk converter to the proper height with one hand, as advertised. ​My desk top is 30 inches from the floor and it is 32" deep so the converter's 31.5" depth was perfect for my use case and it didn't overhang the front or back of my desk, allowing for tidy wire management, and comfortable typing. I am 6'2" tall and when the converter was at full height on my 30" desk top it was comfortable and ergonomically perfect for me. The keyboard tray lay flat on my desktop when in the seated position and only raised my keyboard and mouse about 0.5 inches from their standard position on my desk. I liked the size of the keyboard tray, which is larger than that of any other standing desk converter I've tried. ​My monitors were slightly elevated (5.9 inches higher than they had been) in the seated position, but with a small adjustment to my chair to raise my seat 1-2 inches this was no problem and it remained comfortable to work at my desk when seated. After two weeks (100+ hours) of use, the one thing I'd change about the M2B would be the height of the work surface when flat on my desk. I loved that the desk converter's keyboard tray sits flush with the top of my desk when it's adjusted for seated use, but in my seated position, the 5.9 inch height of the workstation raised my monitors a bit higher than I like. I raised my chair slightly, and this resolved the issue for me, but for shorter people it might be an issue. As I used the workstation on a daily basis I saw that this potential shortcoming could easily be resolved by purchasing monitor mounts (which could eliminate the 3.5" height of my monitor stands and allow users to position their monitors in exactly the right position). The low cost of the M2B makes this a reasonable additional purchase for anyone buying the FlexiSpot computer riser. I should note that this is not unique to the FlexiSpot M2B product ... it's an issue that I have with most desktop converters. While I did receive this standing desk converter for free, I've had the opportunity to test all three of these products. 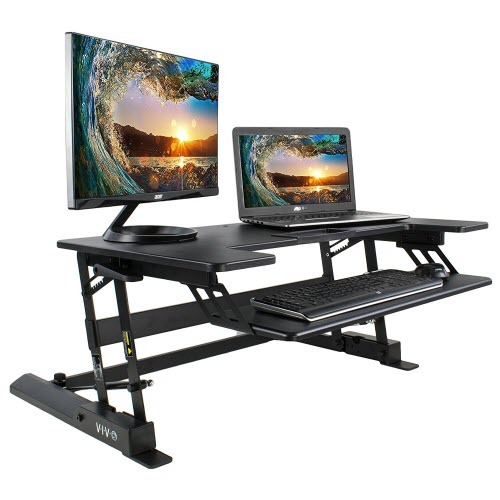 Each has its own merits, but I think a side-by-side comparison is worthwhile as you make your choice about which standing desk converter will be right for you. For me it's a toss-up between the VARIDESK and the FLEXISPOT. I like them both for different reasons. 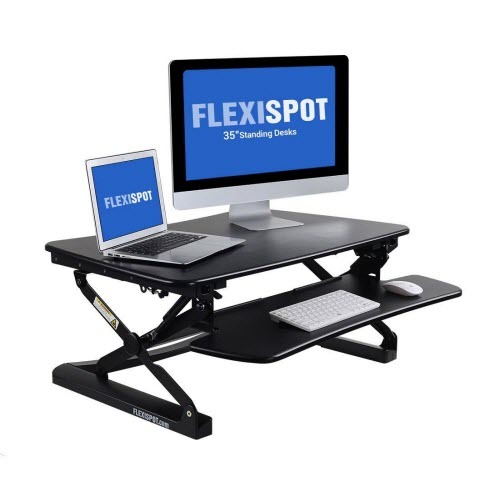 In my view the Flexispot M2B represents the best value of these three popular standing desk converters. While the VIVO is the least expensive of what I consider "good" quality options, I don't feel it performs as well as either the FlexiSpot M2B or the VARIDESK Pro Plus 36. 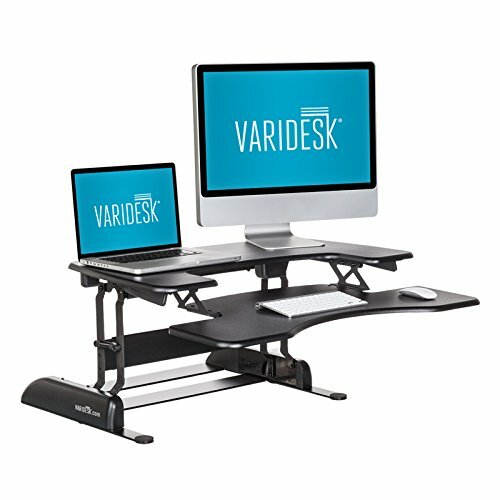 Price - The FlexiSpot standing desk converter is typically available for $150 less than the VARIDESK Pro Plus 36. I was pleased to have the opportunity to use FlexiSpot's well-made workstation on a daily basis for the past few weeks. It is a sturdy piece of office equipment that anyone looking for a standing desk converter will appreciate and enjoy using. If you're in the market for a sit-to-stand desk converter, then I can highly recommend the FlexiSpot 35" M2B Computer Riser.